Diane Namm is an award-winning writer-director-producer for stage and film. 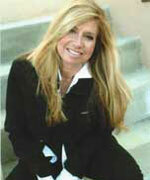 Her film production company, Lady of the Canyon, LLC is currently in development on a number of multi-media projects. Her award-winning films to date are Finding Hope, The Sacrifice, Telemafia, Great American Pigeon Race and Sasa. Her non-profit theater company West of Broadway produces stage adaptations of classics, most recently the critically acclaimed original Mrs. Scrooge The Musical and an award-winning run of Judgment At Nuremberg with an all-star cast. A published author of over 65 books for children and young adults, Diane has served as a writing mentor, developing writing workshops for at-risk youth in juvenile detention centers, rehab centers and group homes. She is on the Advisory Board for the University of Michigan/English Department; Hart-US; Edgemar Center for the Arts; a past Artist-in-Residence at the Pasadena Playhouse, selected in 2011/2012 as “Woman of the Year” by the NAPW and a member of AFI, Women in Film, Authors Guild and National Women in the Arts. Visit Diane on Facebook or twitter.